A Romanian cybersecurity company, Bitdefender was founded in 2001. It develops and sells antivirus software, endpoint security, and other cybersecurity services and products. The software is known to have roughly 500 million users around the globe. Let us have a look at their antivirus products, features, and various performance parameters. Comparing the interface with its previous version, the 2018 edition takes up half the screen space of the desktop. Installing the Bitdefender antivirus software on a system requires the user to create a Bitdefender central account or access an existing one. The user is given the option of installing the 360mb program in a custom location. Once downloaded, the installer performs a quick scan and loads the rest of the program that can be monitored through a progress bar. Comparing the interface with its previous version, the 2018 edition takes up half the screen space of the desktop. Like all other antivirus software, the Bitdefender does not allow you to resize the interface, but it can be moved around. The main screen has a dark theme with subsidiary screens being a bit brighter. The home screen is equipped with an on/off switch for controlling the program’s autopilot function and has buttons for quick start, vulnerability, and full system scan. The display also shows the user’s recent activity regarding their apps, files and website usage. Bitdefender offers three types of Antivirus software- Bitdefender Antivirus Plus, Bitdefender Internet Security, and Bitdefender Total Security multi-device. All these variants line up with Windows 7 and are supported through Windows 10. The basic variant of Bitdefender antivirus offers features such as password manager, secure browser, ransomware immunizer, file shredder, virtual keyboard, wi-fi scanner, and rescue partition. The antivirus has a renewable single license and is currently offered for about $20 per year. Bitdefender’s Internet security package offers everything that is included in its Antivirus Plus version and it offers extra features such as parental controls, 2-way firewall, file encryption, and webcam protection. The software is a multi-license device and is currently priced at about $40 for one year. 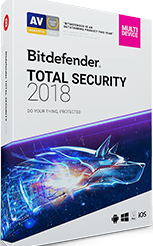 Cumulative of the above-mentioned two variants, the Bitdefender Total Security antivirus offers added features such as system optimizer and anti-theft. Bitdefender allows this variant to be bundled with Mac and Android. Currently priced at about $45 per year, Bitdefender Total Security offers multiple licenses for five devices. Bitdefender protection starts with a file-scanning engine that scans the system for known exploits. The heuristic scanner monitors for signs of attacks that might be underway. If it does come across anything suspicious, then the system blocks the attack and uploads it on to the company’s cloud center lab for quarantine. It also updates information about the same and sends it to their users across the globe. A different feature of the software is that it allows its user to opt out of data collection program. One of the best features of Bitdefender’s is the autopilot where it automatically adjusts the software’s defensive posture. The user can also whitelist applications and reduce the interruption by setting the program on movie or game mode. Bitdefender’s safe file feature helps the user cordon off and theoretically immunize ransomware attack on the files. It also allows the user to schedule scan the system in just two clicks. It allows nightly, weekly, and monthly scans, which can be done by accessing the manage scan section. Bitdefender’s latest line-up adds up new privacy and security features in its line of defense. The Internet Security and Total security variants of Bitdefender offer Webcam protection in which it allows the user to limit which programs can use the webcam. The user will have to manually add approved apps. The antivirus is no less in providing tracking features in case of a lost or stolen laptop. Total security helps in locating the misplaced machine on the map and allows the user to remotely wipe the drive only when it switched on. It helps the user keep their files hidden with the help of three-pass file shredder. The internet security does the same with the help of 256-bit AES file encryption tool. On installing the software for the first time, it took the software an hour and 22 minutes. After three consecutive scans that helped the software to learn about the importance of files, it took the software an odd 35 minutes to complete a full system scan. Bitdefender quick scans are pretty fast compared to its counterparts. It takes roughly 13 seconds to complete a single quick scan. They also offer 24/7 tech support that lets you contact the support team through the antivirus interface. You can also email the technicians, ask your queries through chat or simply read support forums. However, being a low-end antivirus, it is one of the best choices for single or multi-license PC protection. The user can set up a 30-day free trial after which they will have to pay to get a licensed version with full features.